It was an honor to join three co-authors who published a centennial history about the state’s nursing profession in Maine Nursing: Interviews and History of Caring and Competency. In book discussions conducted since the publication, I have enjoyed telling about some of the history of nursing before 1914, the centennial year, during the time before the Maine State Board of Nursing was created. Madawaska’s Tante Blanche is one of those stories. In the 1790s, there were no formal or trained nurses, because most health care was provided in convents that served as hospitals. Public health nursing was unheard of at that time. Yet, Tante Blanche created a legacy to demonstrate how to provide life saving interventions during a time of famine, in Madawaska, when the territory was not yet part of Maine. Her heroism is remembered and she is revered in local histories as a saint. Recently, I spoke to a group of University of Southern Maine students, at a class on the Gorham campus. Our hour flew by, so I was unable to tell them this particular history story. Therefore, I’ll include the heroism of Tante Blanch in this blog. Although I’ve read several accounts about Tante Blanche, and the way she rescued her people during a period of famine, this particular narrative, published in the centennial publication commemorating the founding of the Town of Madawaska, is my favorite. There is no author attributed to this history. Julia D. Albert is the author of the Madawaska commemorative book. This archives is also available at the Madawaska Historical Society. In the 1790’s, there were only about thirty families living in Madawaska. Besides farming, the industries at the time were maple sugar, fur trading and moving lumber needed to help build English ships. Grain production was profitable and the colony actually exported some of the harvest, but the production was challenged when two years of floods and September frosts destroyed nearly all the crops. As a result, in 1797, the year became known as the year of “la grande disette” or “misère noire” (utter destruction). In other words, the year of the great famine. When the winters of 1796 (and 1797) were particularly harsh, many of the colonists left for Fredericton or traveled up the St. Lawrence River. Those who stayed in Madawaska lived exclusively on stored wild meat and herbs. At the end of a particularly long period of waiting and anguish, when the men were gone and snow had fallen for eight days without stopping, all the food was gone. The last of the boiled wheat was gone, the last cow was slaughtered and eaten. During those long days of hunger and anxiety, Marguerite Blanche Thibodeau, the wife of Joseph Cyr, accomplished her wonders of heroism and charity. She became the angel protector of the weak, the infirm and sick. Her skill proved to be the saving strength of the miserable colonists who were suffering, being without food. In my opinion, her skillful response to this crises was a public health nursing intervention. 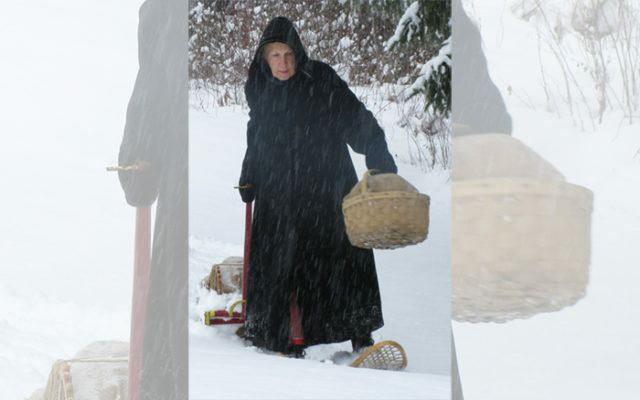 On her snow shoes, with a load of clothing and provisions that she would do without or that she had collected, she went from door to door, distributing a ray of hope. She also helped to ration the few provisions available in a way that helped provide a little to those most in need. Laying out the dead, snatching from the grave those who were surely doomed without her help, she gave her care and lifted the morale of those who had given in to their misfortune. Eventually, the men returned with the body of one who had died of privation and cold and another was dying. But, also, they returned with a little food. The colony was saved. Tante Blanche, as she was know, became the object of general veneration. It was reported that she cured the sick, chased out evil spirits, found lost objects, reconciled enemies and brought good luck just by wishing for it. She softened the most hardened souls, reformed blasphemies and brought conniving cheaters to live exemplary lives. Even hopeless drunkards were more afraid of her word of admonition than they were of the bishop. More than one mustache was wet with tears when Tante Blanche was lowered into her quasi-royal grave. She was the real aunt for a great number of young Madawaska families. A “Leblanc” on her mother’s side, she was the granddaughter of René Leblanc, the notary of Grand-Pre, mentioned in Evangeline. She died in 1810, and was exposed in the church of St. Basile, in Madawaska County, New Brunswick, a privilege never before accorded and to very few since. In summary, to add to the many well deserved accolades in tribute to Tante Blanche, I consider her to also be Maine’s very first nurse.